She was born with spinal curvatures, one hip higher than the other and severely turned-in feet. She was forced to wear leg braces for seven years. When she wrote Callanetics For Your Back, she was consulting not just research (at a time before the internet) but personal experience. She knew what could cause injuries, spasms, and chronic pain. Splits, lunges, deep knee bends. Can injure knees and groin. 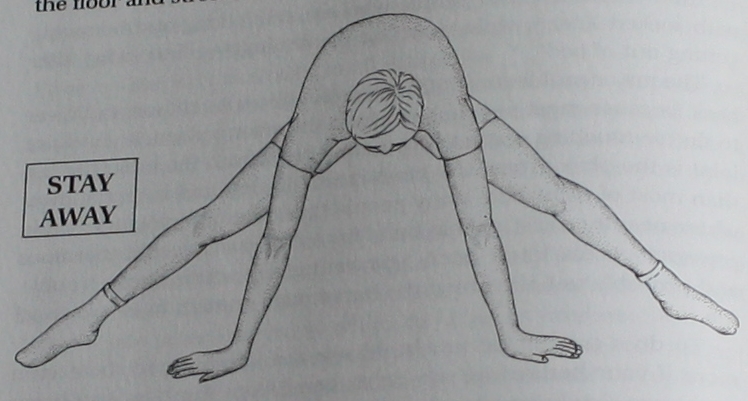 Shoulder stands, bicycling with legs in air, plough in yoga. Can you guess what you’re injuring here? 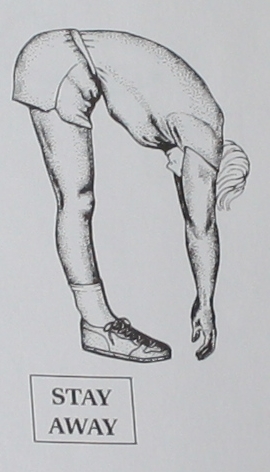 (“The position crunches the more fragile vertebrae of the neck.”) Even neck rolls, when you drop the head back, can do this. Waist circles and waist bends. Can injure lower back. A safer way to do this is to support your back by placing that lower arm on your hip, and by tipping the pelvis up, i.e. the pelvic wave. Leg thrusts, to back or side. Injures lower back. 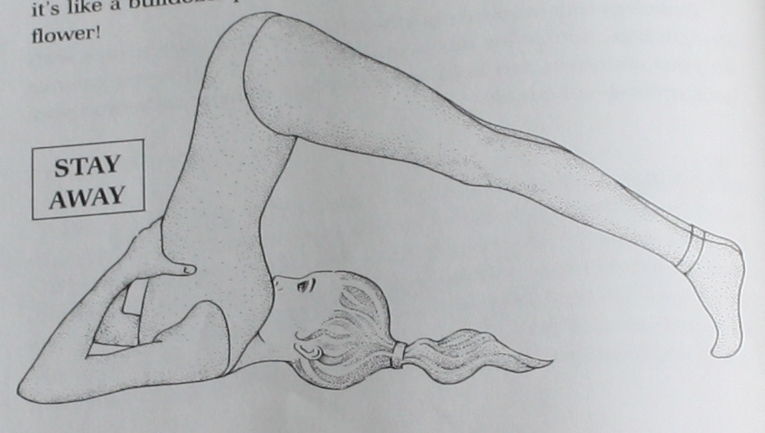 Again, note her arched back in this diagram. 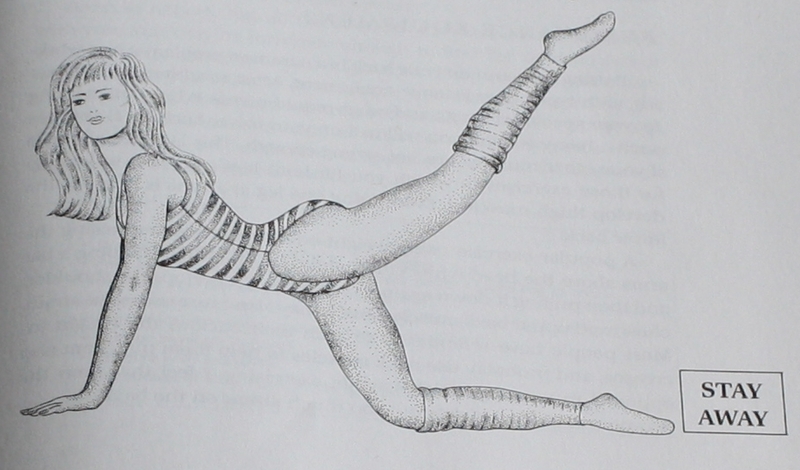 Callan’s “exercises for the hips and behind” are a LOT more effective, I can attest. These “stay away” positions can damage muscles, nerves, discs, tendons, and ligaments. Some damage can be life-long, especially if you keep reinjuring yourself. Something else she talks about is losing your balance. I don’t hear this much. Tilting your head back or bending over or swinging your arms and legs vigorously can increase the risk of a fall. If there’s one thing you don’t want to do, it’s fall. No falling. “Callanetics For Your Back” is a great book. Pinckney had a real passion for and commitment to her work. She was one-of-a-kind. This entry was posted in Uncategorized on May 25, 2017 by Bix. I did go back and look at my book from 1984 after reading your post yesterday. Now, after today’s post I think your “back” book would be better suited for me now (after 33 years!!). I did read your link to her page on Wikepedia, which was very interesting on her life and growth of Callanetics. If there was a news item of her death I missed that too. But am going to try some of the exercises, keeping in mind the warnings above. Thanks for reviving this exercise program. In this back book, she has you work your way up to doing the exercises, Stage 1 and Stage 2, etc. Which I am thankful for! I like her instructions, they really complement her descriptions in the book. And I like her! Little phrases she says like “No jerking!” and, “We all do that, it’s horrible,” make me laugh. I wish she was still alive. Me too. She was a marvel. I meant to say … I can’t believe you had her book! Callan was the best, she was way ahead of her time. Her exercises are the only ones I can do with out hurting myself. Thanks Callan for the best exercises ever, especially for a woman’s body. I started using these in the late 80’s, and still use them. I love the lotte berk dvd’s too, and the bar method. The T-tapp workout saved my knees after three injuries in the same location but I believe it’s the earlier workouts that kept my muscles more limber. Teresa Tapp passed last year, but her approach is also fantastic for all body types. I just looked up Teresa Tapp. She reminds me of Callan Pinckney … low impact and safe for anyone. Thank you! I love TTapp too and am very sorry for the loss of Teresa she was an inspiration. But it was Callanetics that got me in shape and has kept me tight and toned and lifted. Most people because of these exercises can’t believe I’m as old as I am. As women age we spread and most conventional exercises build bulky muscles the last thing a mature woman wants. That’s why I say this is the best exercises for a womans body. I have to get back to my Callanetics. She has a really good stomach exercise. It’s the only thing that doesn’t end up hurting my back. I’ve been doing Oxycise first and than doing Callanetics and I’m getting dramatic results. I think I found my combo that works for me. I do TTapp in between the Callanetics and do Oxycise 6 days a week. I don’t want to miss out just in case.